At 9 a.m. on April 16, a lunch ceremony was held at Hebei Provincial Museum for historical relics displayed in Hebei Pavilion. The Gilt Bronze Human-shaped Lamp and Big Sculpture for Palace Gate are being sent to Shanghai as the first batch of rare historical relics. The Gilt Bronze Human-shaped Lamp was unearthed in the Han Tombs in Mancheng, Hebei province, whose Chinese name means the resting place of Empress Dowager in the Western Han Dynasty. The lamp is 48 centimeters tall, with gilding all over it, showing an imperial palace maid holding a lamp. The lamp’s original design had the right arm of the maid holding a pipe away from her body, which kept the soot in the body of the maid to maintain the cleanliness of the room. 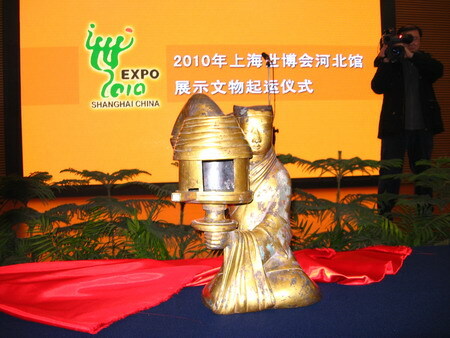 In 1993, the lamp was rated as a national treasure, and it is the most precious relic in the Hebei Provincial Museum. The Big Sculpture for Palace Gate, a bronze with dragons and a phoenix, was unearthed in the Remains of Secondary Capital of Yan in Baoding, Hebei province. It is a ring-shaped sculpture measuring 74.5 centimeters long and 36.8 centimeters wide, and weighs 21.5 kilograms. Eight animals are carved onto the sculpture, which combines the art of relief and openwork carving. The heads of the dragons, phoenix, and snakes are all protruding above the surface. It is assumed that it was used for the palace gate for its large body rarely seen in China. It shows the excellent carving skill and is truly an art treasure.